Northbound dayliner in the snow. Winter 2004. Northbound dayliner at Langford. 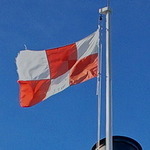 February 2005. 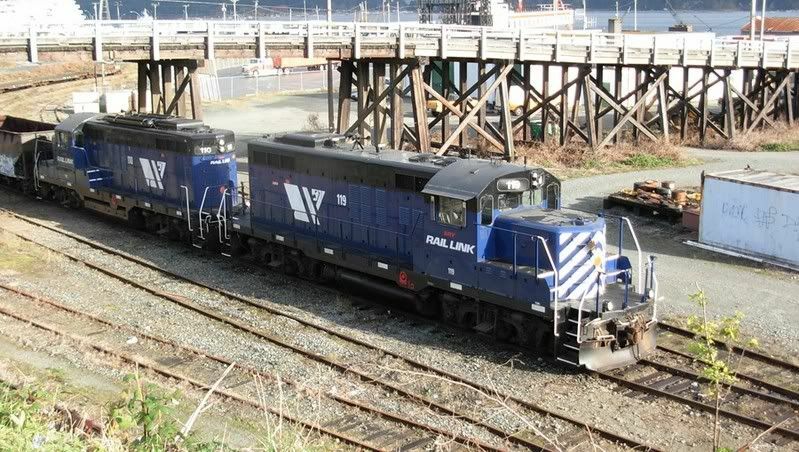 Southbound dayliner at Nanaimo, March 2004. Switchman's tools. 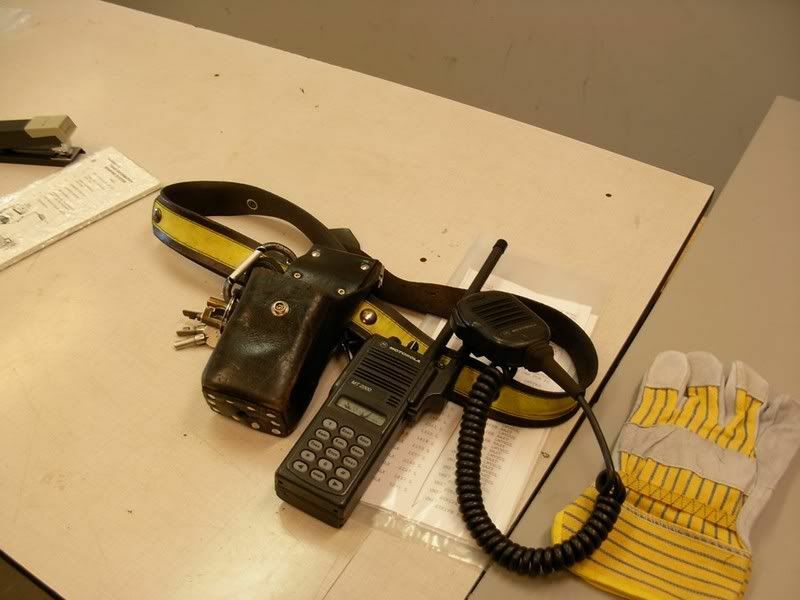 Radio, belt, gloves, keys, etc. Yes, thank you all; although not much more than a layman fan, I nonetheless much appreciate the posting of such rich and historical photographs. Car 6133, Where Were You? A visitor from the E&N, VIA Budd RDC 6148 sits at CN's Thornton yard in Surrey waiting to be hauled into Vancouver to VIA Rail. 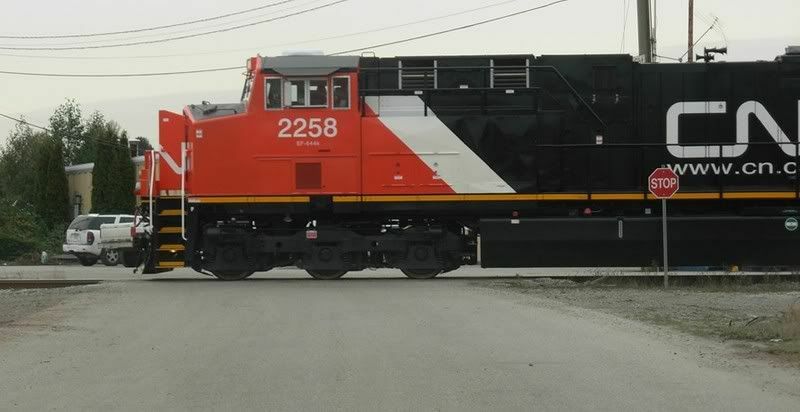 Brand Spanking new locomotive, built by General Electric. Great additions to the thread; thanks, CrashNational, Jim, Michael. Any word on the reason for her being on the Lower Mainland? It's going to Moncton to have Retention tanks installed on the toilets. Can't let them flush onto the tracks anymore. 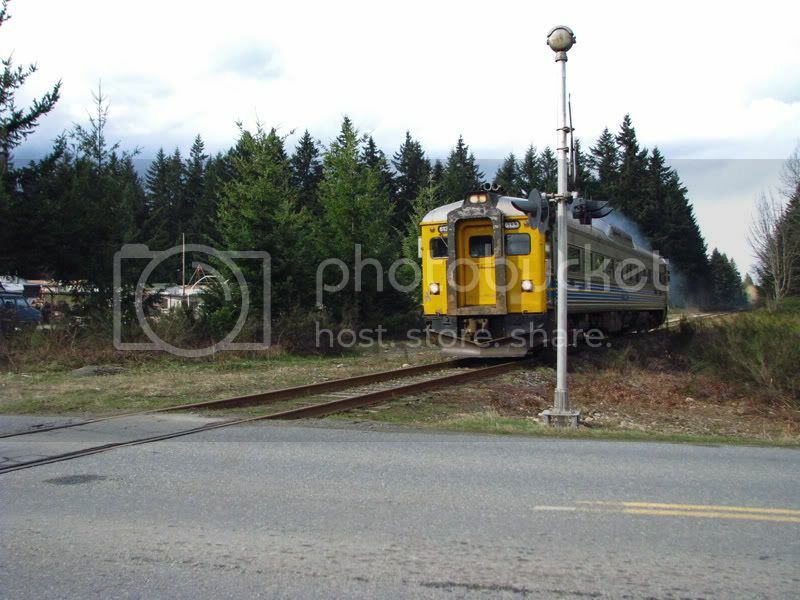 Video of a southbound Southern Railway of Vancouver Island(E&N) freight train in Nanaimo. Northbound through Nanaimo about an hour earlier. Switching a customer in Nanaimo. 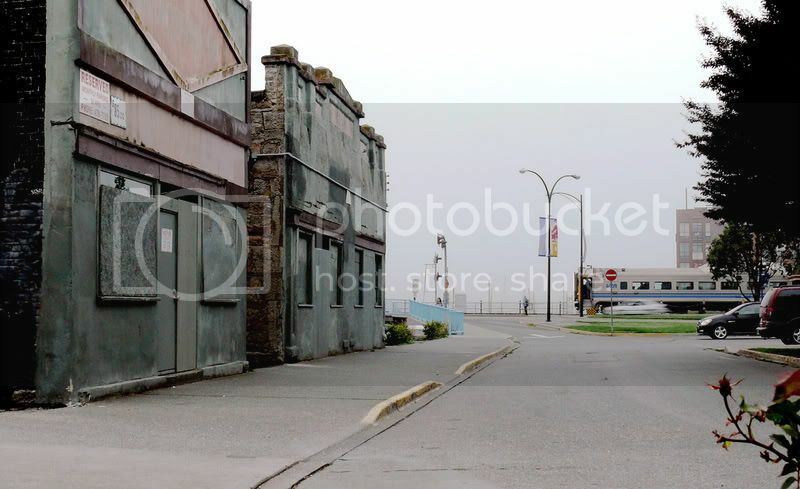 Dayliner at Nanaimo, the burned-out station is in the background. Best Photo Ever a-la-Simpsons' Comic Book Guy. Thanks for that great shot. 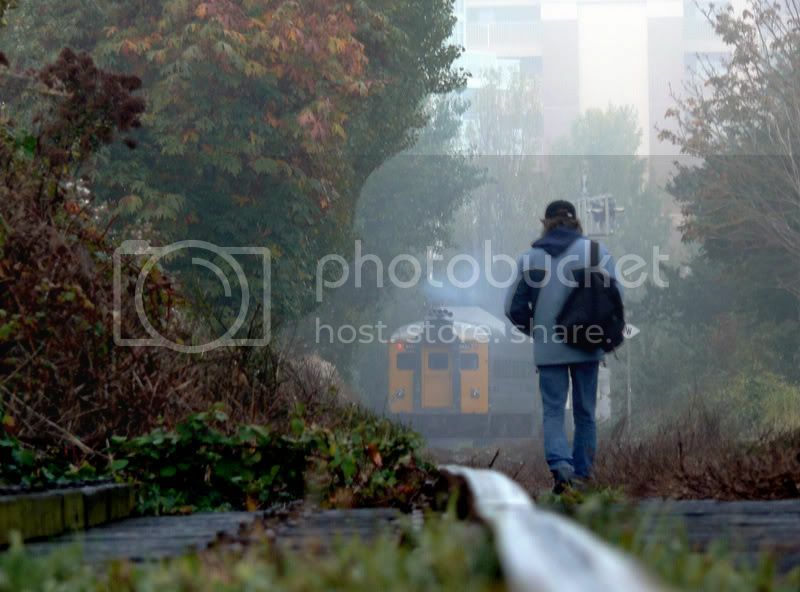 How sad the loss is - Still nice photography though; thanks again for your efforts. Here is the little chance that I was afforded to photograph the same, as we all had in mind, without the benefit of knowing when she'd burn. The building had been neglected for years. CP Rail never maintained it saying VIA Rail was responsible for up-keep as per the lease agreement. VIA never did any up-keep saying CP Rail was responsible because CP Rail owned the building. 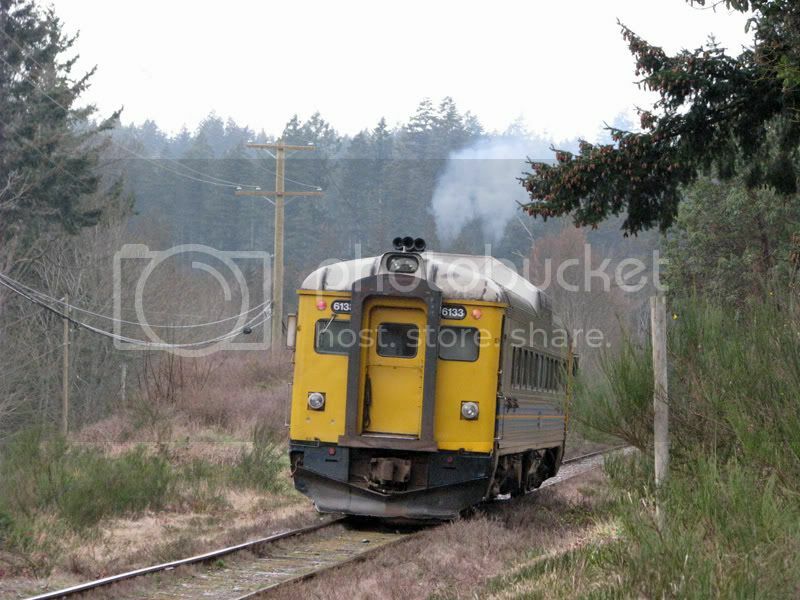 The City of Nanaimo and before that a retired railroader would take care of the up-keep. Hopefully the ICF can restore the building. BTW, I was on the Queen of Coquitlam going both ways. 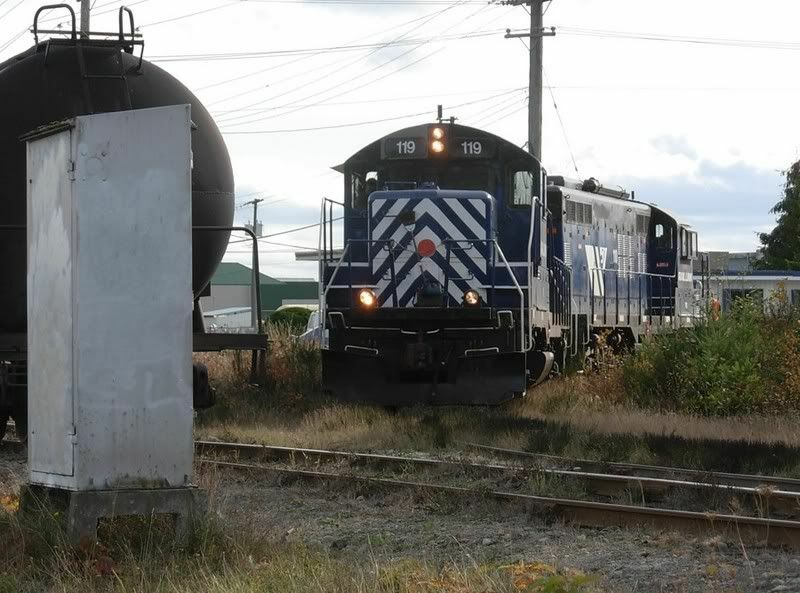 In this update: A walking tour of the line from the E&N Railway interchange at the Johnson Street Bridge to the end of the line at McKenzie Ave. 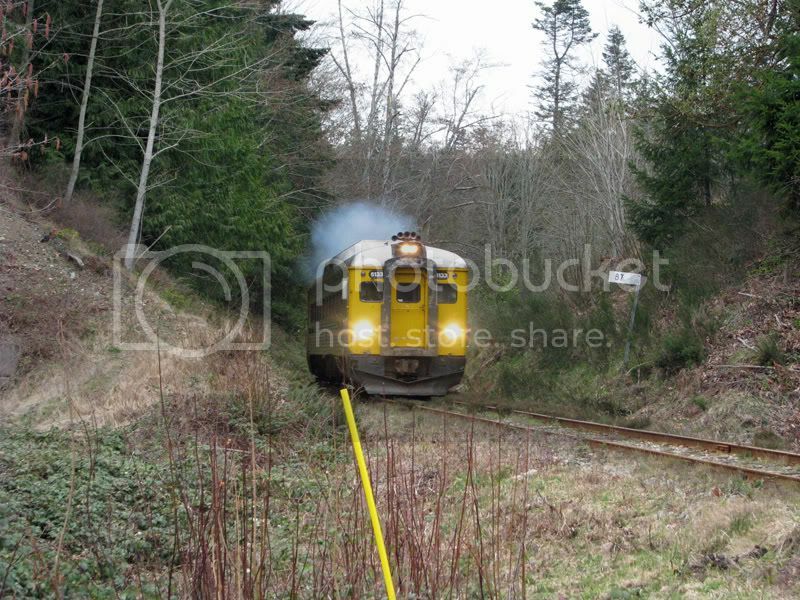 The photos below show the crew turning the engine on the wye alongside the Island Hiway near the Town and Country Mall, today this is where the Saanich Spur leaves the Galloping Goose. 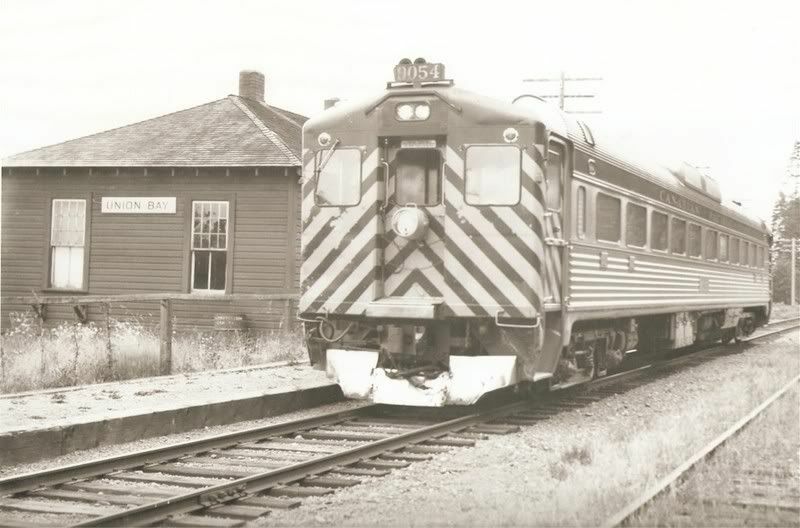 1003 was the regular locomotive for Victoria. Northbound over the Swan Lake Trestle in the cab of the CN 7156. 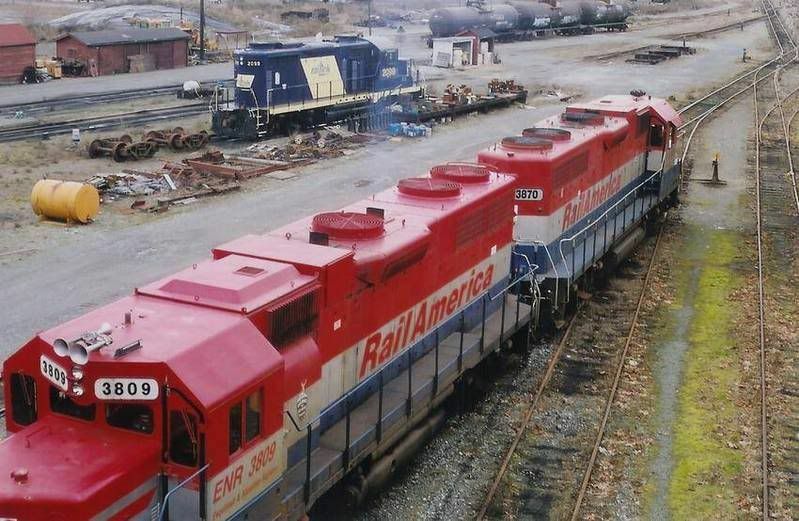 A GM SW8(800 hp) that was retired in 1986, replaced by the 1003. 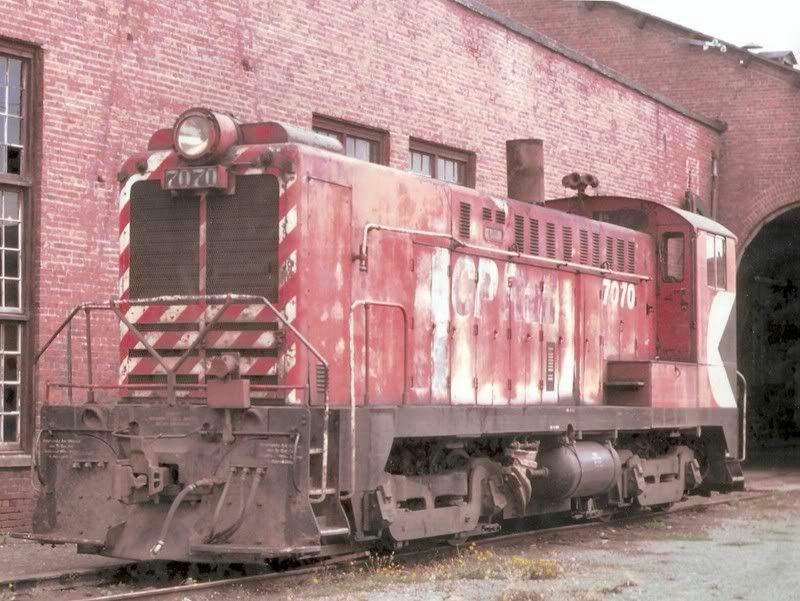 7154 and 7156 were regulars in Victoria for years. BC Rail on the E&N? It happened. 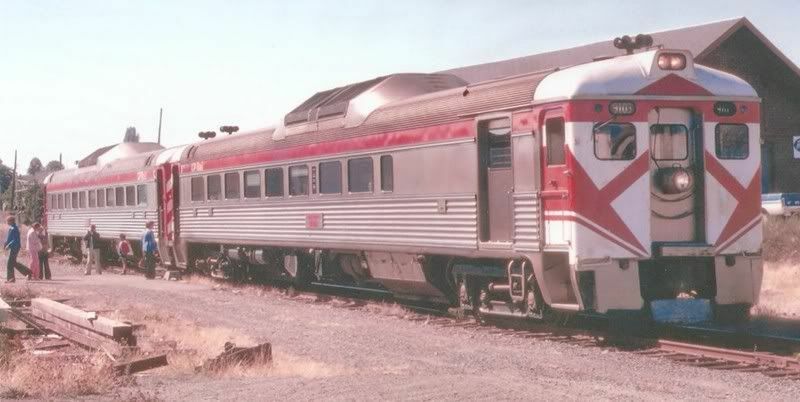 BC-31 was used by the Premier to tour the E&N in the 1970's. 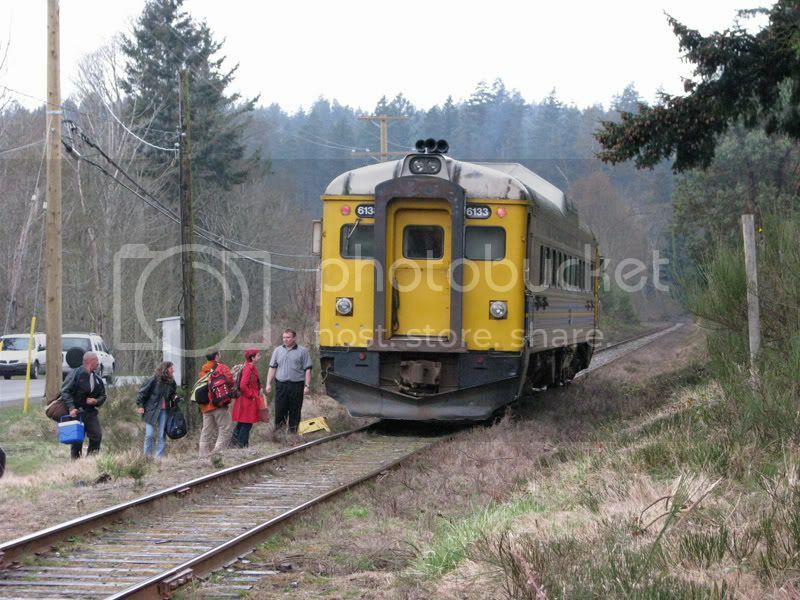 CP Rail only had one Budd Car on the E&N at the time so they had to borrow a car from BC Rail. From a post card, photo by Richard Isles. I found this photo on an old disk. 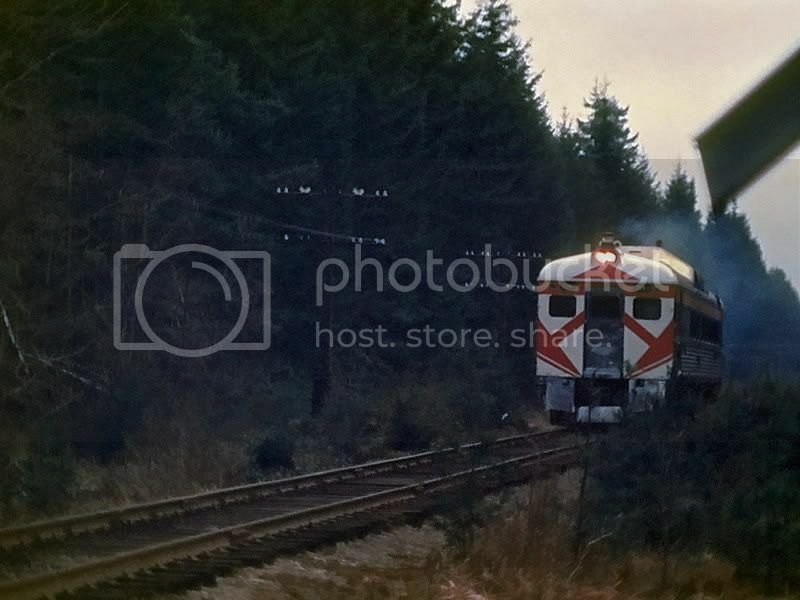 E&N train No.1, the dayliner at Nanaimo a few years before VIA Rail took over the passenger service. Photo is by Bob Hunter. Another old E&N photo. By Gary Oliver. 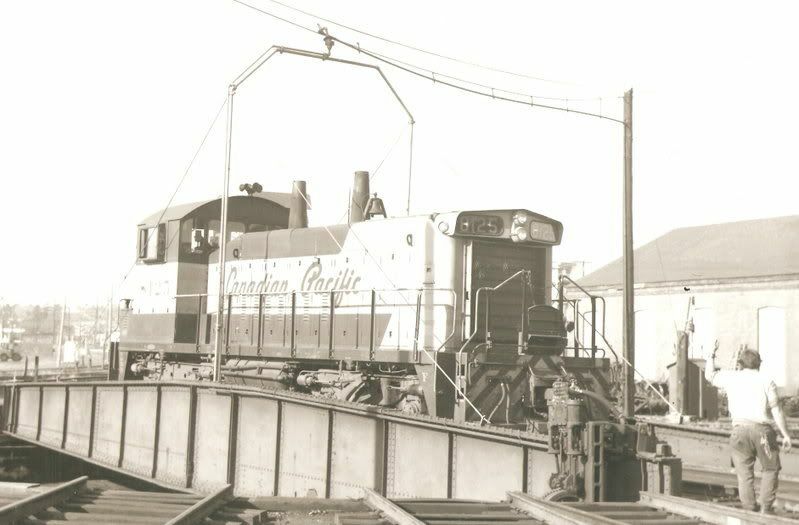 E&N Train No.1, the northbound dayliner at Union Bay circa 1960. Today all that remains at Union Bay is a platform and station sign. The siding has been removed and the station has been demolished. 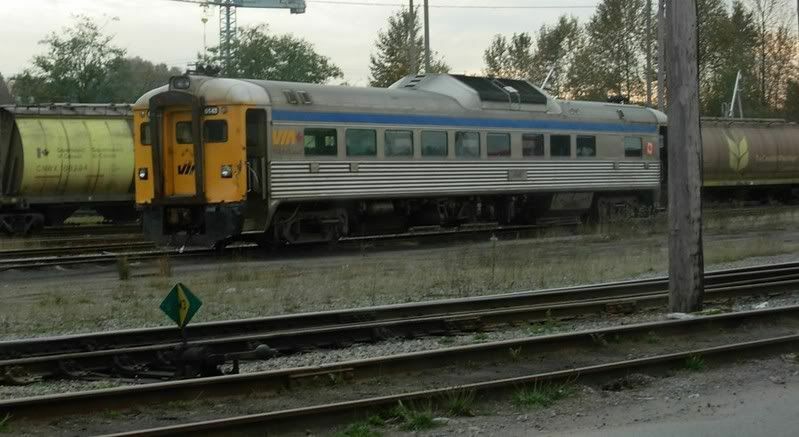 Until VIA Rail took over passenger service, it was just called the Dayliner. Train no.1 was the northbound dayliner and train no.2 was the southbound dayliner. 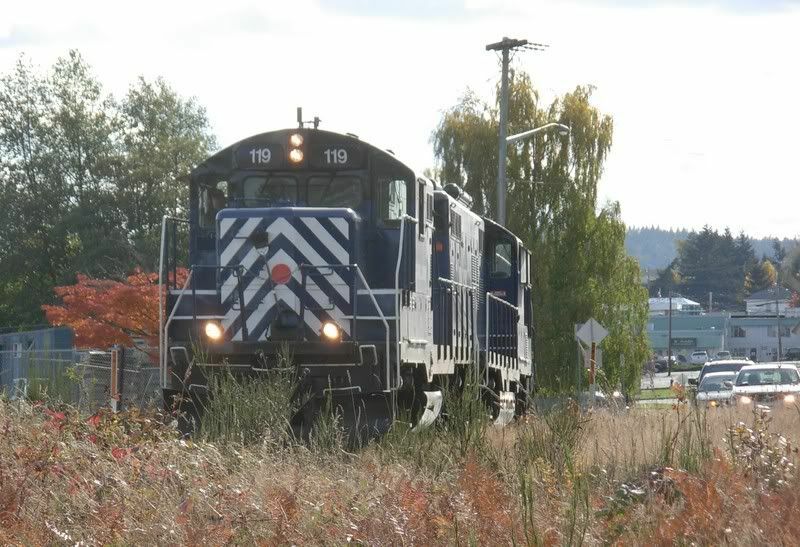 The train was renamed the Malahat and was renumbered no.199 for the northbound train and no.198 for the southbound train. Edit: A few other old E&N photos. CP SW1200RS 8125 on the turntable at Victoria. Pat Hind photo. Here's an interesting one, Baldwin #8011 outside the engine shed in Duncan. 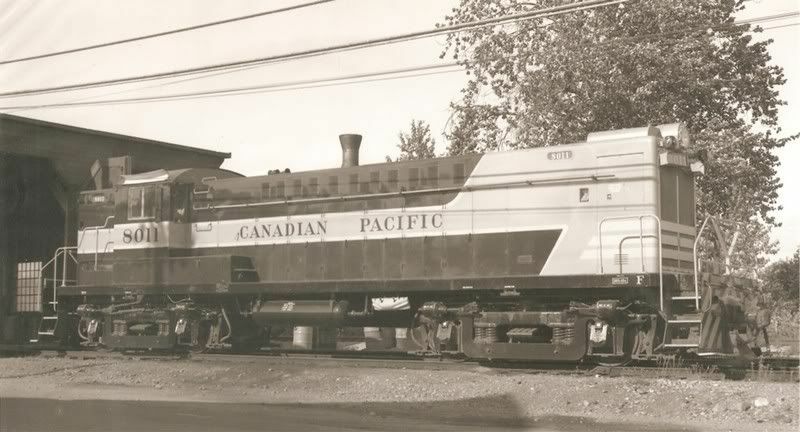 At one time the E&N had shops at Duncan to service locomotives that worked the Lake Cowichan and Crofton branch lines. Gary Oliver photo. The E&N used to be a busy railway. 2 freights in and out of Victoria a day plus yard jobs in Victoria, 2 or 3 freights out of Lake Cowichan to Ladysmith a day, daily freights to Courtenay, Nanaimo yard and industrial switch jobs, 2 or 3 freight trains a day to Port Alberni, Port Alberni yard and industrial switchers, and 2 daily passenger trains(Victoria-Courtenay and Parksville-Port Alberni). Even into the 21st century the E&N was moderately busy. 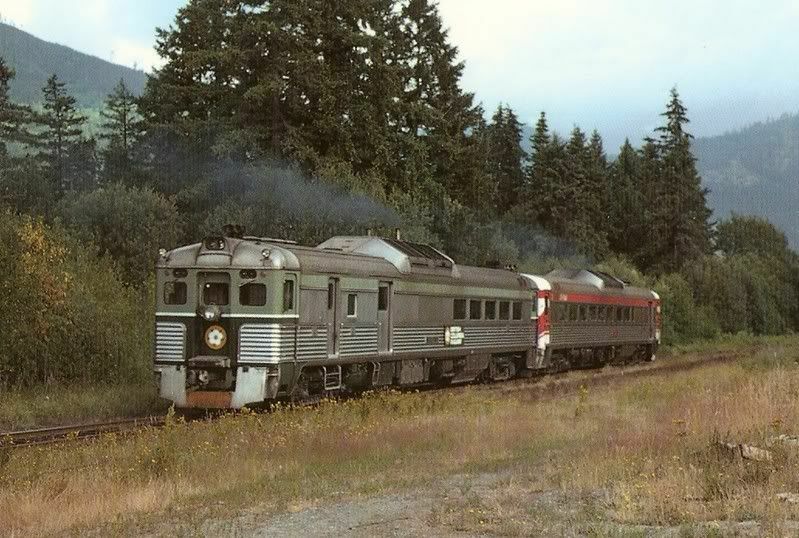 In 2001 the E&N was running 2 freight trains a week to Victoria, 3 trains a week to Duncan, 1 train a week to Courtenay, daily except Saturday freight service to Port Alberni, the daily VIA Rail passenger train, and the twice daily Pacific Wilderness Railway excursions from Victoria to the top of the Malahat and return. It's sad to think of what the E&N is now. 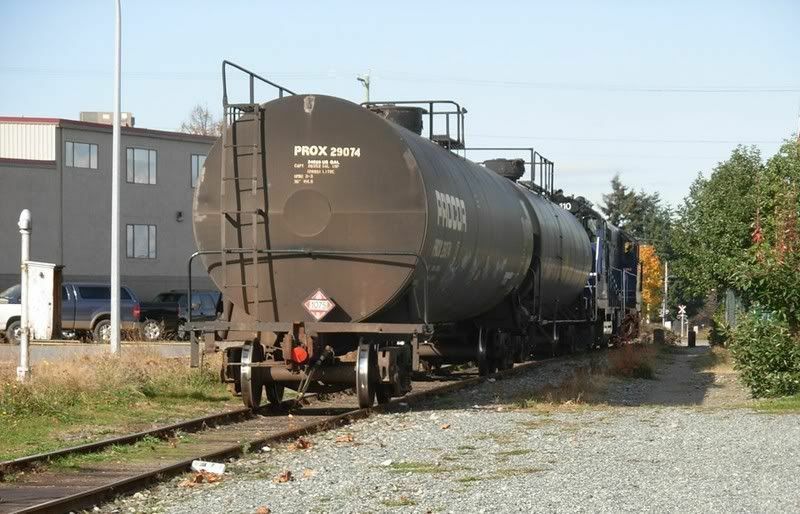 One daily passenger train and the Nanaimo yard/industrial switcher that runs south to Duncan or north to Courtenay when required. Here's one of the regular Victoria yard goats outside the roundhouse. Bob Hunter photo. The Dayliner picking up people at Nanoose. All Aboard! Away he goes and only 10 min. late! And finally smoking a bit through the crossing at Nanaimo airport. As promised in an earlier post here is the video of the Dayliner rolling through Nanoose. This was my first video with my new camera and I was pleasently surprised by the quality. The shake in the beginning is not the camera, but the cameraman being a little jumpy at the horn. Nice photos of the dayliner. Sorry, these are a tad large photos. Here it is at Qualicum Beach. Running 2 cars that day. 6135 and 6133. 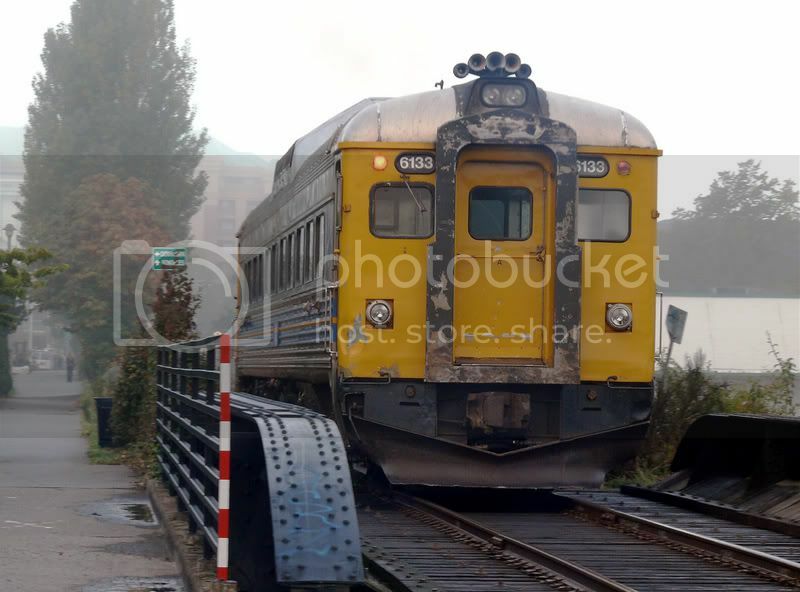 6148 is still in Vancouver. And at Nanaimo a few hours earlier. The Dayliner doesn't have a locomotive? * I clicked on the Blue22 link in the Wiki and saw that refurbished Budd Cars are to be used for the link to Toronto's airport. That is the first time I have heard that mentioned. The line has received funding in the latest transit push in Ontario but is by no means cast in stone. I think it would be neat to ride on refurbished "Dayliners". However I wonder why they wouldn't use the new light rail lines they are talking about putting all over the city and will be used to replace our streetcars. Each budd car has 2 engines mounted under the floor, one at each end of the car, they connect to the axles via auto transmission and drive shafts. 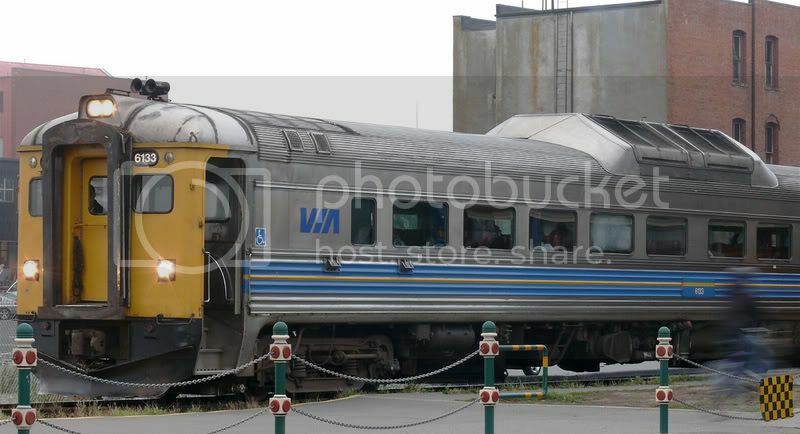 Just to be absolutely clear these RDC's (rail diesel car) are driven directly by their diesel motors, right. 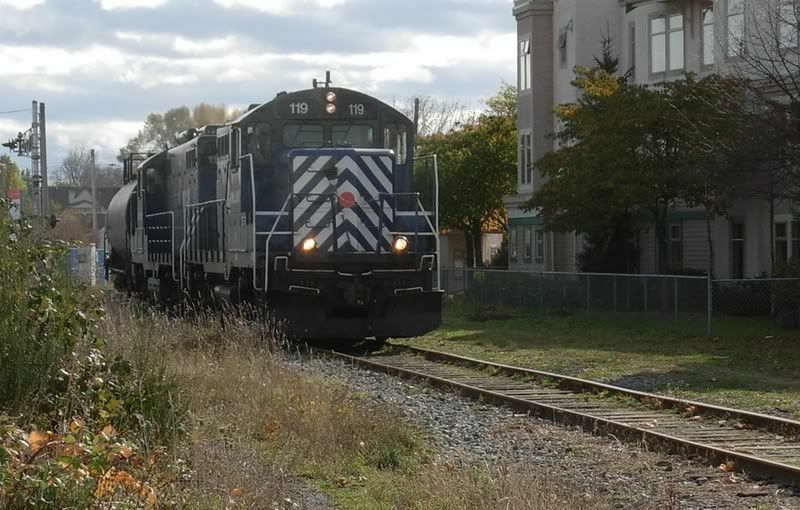 This is in contrast to diesel locomotives (or correctly diesel-electric locomotives) that are actually driven by electric traction motors on each axle which are fed with electric power generated by on board diesel engines. You're absolutely correct, I should have mentioned that.